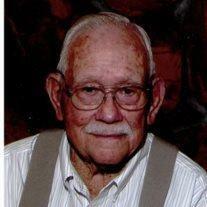 Clevenger, Ernest Andrew, 94, passed away peacefully Wed., Jan. 29, 2014 at his home in Lehi, AZ. Ernest was born Dec. 25, 1919 in Mesa, AZ to Andrew Benton and Lola May (Pepper) Clevenger. Ernest married his high school sweetheart Dorothy Shill (deceased). They were blessed to have 5 children, Ernest Andrew Jr. (Irene), David Benton, Jack Eldon (Peggy), Judith Roland (Gary) and Linda Sue Smith (Michael, deceased).They had 15 grandchildren, 65 great-grandchildren, and 5 great-great-grandchildren. Services will be held Fri., Feb. 7, 2014 at 10 AM at Bunker’s Garden Chapel, 33 N. Centennial Way, Mesa, AZ with a visitation Thurs., Feb. 6, 2014 from 6-8 PM at Bunker’s Garden Chapel. The family would like to thank Hospice of the Valley for their help at this time.